With over 10,000 restaurants serving every conceivable cuisine, it’s hardly surprising New York has long been considered the food capital of the world. On the other hand, finding that perfect gem that combines an aesthetically inviting atmosphere with an eclectic menu and diverse drink options can still be a tall order even though plenty of places exist. One of these is La Pulperia, a contemporary Latin and Argentinian-themed restaurant with two locations in Hell’s Kitchen and on the Upper East Side offering all this and more. In fact, for inventiveness alone, it may just be the best of the lot. First opened in Hell’s Kitchen in 2014, in New York’s dining destination Restaurant Row (West 46th Street, between 8th and 9th Avenues), the name and concept were adapted from the general stores found in rural parts of South America that first rose to prominence in the late 1800s and also functioned as central meeting places and drinking establishments. La Pulperia’s website describes it as a “cockteleria and restaurant featuring rustic Latin cuisine.” However, don’t let such labels, its name, nor the signage or string of white lightbulbs adorning the outside entrances of all two locations fool you because its décor is anything but rustic. With interiors by designer Andres Gomez whose other restaurants include Red Rooster, Whitehall and SoCo, La Pulperia incorporates such eye-catching features as red-leather tufted banquettes, reclaimed Brazilian wood on the ceiling and walls, handcrafted Mexican floor tiles, and abundant shelving that prominently displays wine, fresh produce and a wide selection of liquor. 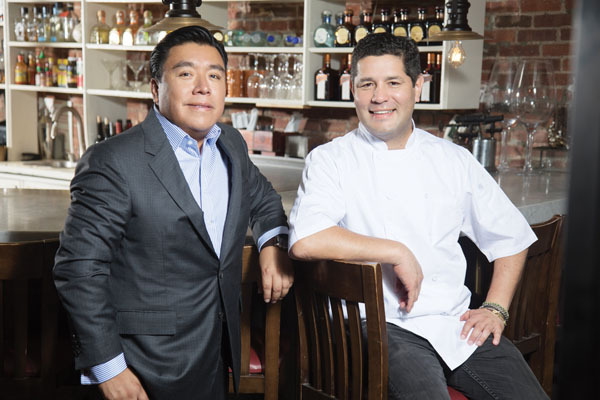 The co-owners Victor Medina and Carlos Barroz, who also serves as executive chef, are originally from Mexico and Argentina respectively. However, Medina quickly dispels any misconception that La Pulperia only offers Mexican and Argentinian food because of their heritage. The result is a veritable cornucopia of seafood, meat and vegetarian dishes that accentuate the diversity and contemporary culinary influences of Latin America, Spain, Italy, the United States and even Russia and France. 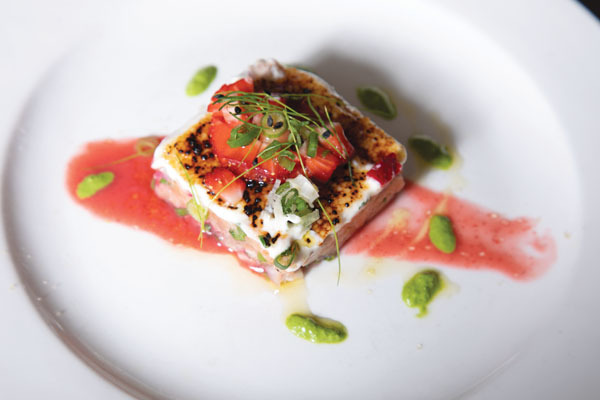 Among the most popular items are starters and entrées like El Salmon Brûlée: Verlasso salmon tartar, fromage brulee, strawberry and ginger leche de tigre and micro bull blood greens; Cazuela de Pulpo: Spanish chorizo, carrot puree, green peas, pickled red onions and mole poblano; Shrimp Ceviche: avocado mousse, coconut flakes, red onions and aji Amarillo leche de tigre; Las Tablas: grilled proteins, including pulpo (octopus) and hanger steak, accompanied by five seasonal “cazuelitas,” or side dishes. Proteins include pulpo (octopus) and hanger steak; Pacu Fish Ribs: Grilled Brazilian fish ribs, orange chipotle BBQ sauce and coconut rice; and Moqueca Mixta: Squid, shrimp, mussels, white fish, scallops, soy beans, Spanish chorizo, bacala, green coconut rice and dende oil. For dessert, there are delicacies like the Mezcal Chocolate Mousse made with Riazuleno Classico Juven, olive oil flowerless cake, popcorn toffee, expresso crumbs and 24-carrott edible gold flakes. For those who prefer a more tangy taste, there’s the Mango & Lychee Tres Leches, a citrus flavored sponge cake topped with coconut mousse and sake soak, with a dollop of whipped cream, white shavings, mango and lychee pico de gallo. Another thing at the heart of what sets La Pulperia apart is the drinks. In addition to traditional sangria and margaritas, as well a wide selection of bottled and draft beers, wines and traditional top-shelf spirits like gin, vodka, scotch, whisky, tequila and rum, they even have mixologist crafting a miscellaneous assortment of specialty cocktails. Must-tries (at least once) include La Pulperia UES: Raizul tequila, fresh pineapple, lime juice and volcanic lava salt rim; the Upper East Side Lady: strawberry infused gin, elder flower liquor, lavender nectar and gold flakes; and The Smokey Room: house mescal and milagro, passion fruit puree, fresh pomegranate juice and agave nectar. On weekends meanwhile, guests can add a bit of Latin spice to their brunch with exotic fare like Lobster and Baked Eggs seasoned with fresh herbs, crema de blue cheese, fresh cream and truffled scented toasted bread; the La Pulperia Omelette with caramelized onion, roasted red peppers, tomato confit, Chihuahua cheese, a side order of home fries and house salad; and Tortilla Espanola, a Spanish style omelette with potato confit, onions and a choice of cheese or chorizo. There’s also an ample selection of weekend-only specialty cocktails—including Unlimited Brunch Cocktails for $25 per person during Saturday and Sunday brunch on the Upper East Side from noon to 4:pm, as well You Only Live Once (YOLO) mimosas for $25 each. And besides eating and drinking, there are abundance of ways to enjoy La Pulperia for entertainment and educational purposes. For example, on the Upper East Side, which also delivers, there is live jazz every Monday evening along with ladies night on Tuesdays from 5:pm to 7:pm. The Hell’s Kitchen location also hosts a ladies night during these hours along with a drag brunch on Sundays. Other activities include private mixology and cooking classes by appointment and a live DJ on Mondays through Fridays from 4:00pm to 8:00pm during happy hour. As for Medina and Barroz, the co-principals’ collective backgrounds are just as noteworthy and unique as La Pulperia’s menu and extracurricular offerings. 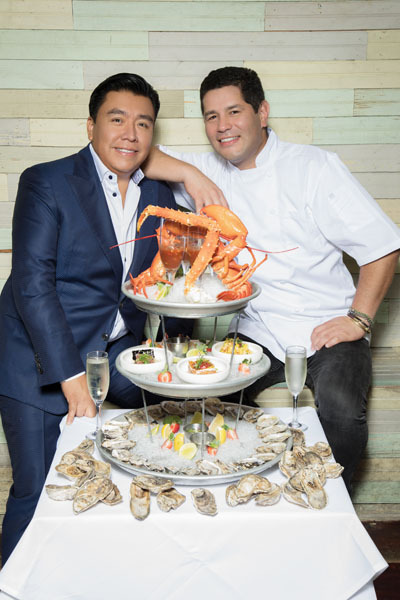 Having each immigrated to the United States in 2000, both cut their respective culinary teeth with a myriad of assorted jobs in various restaurants in New York and Miami. With one thing leading to the next, in 2008 they eventually met and became fast friends after they were hired at a popular Mexican restaurant in Manhattan, with Medina ultimately becoming a general manager and Barroz working as a sous chef. 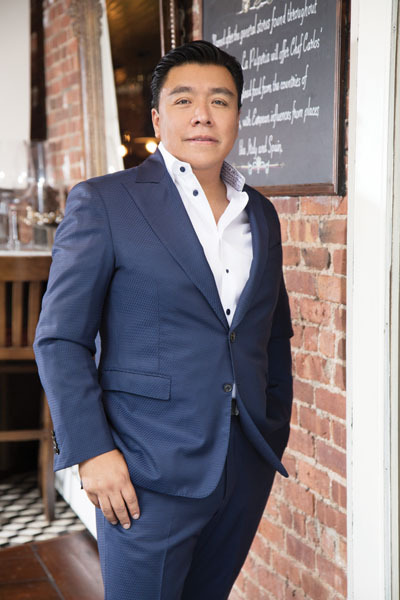 Soon after, and with his self-confidence bolstered by a glowing review of the Mexican restaurant that featured his picture in The New York Times, Medina embarked on the path that would ultimately lead to the creation of La Pulperia. Barroz took the first entrepreneurial leap in 2009—opening two restaurants in Stone Harbor, New Jersey, The Taco Shop and Quahog’s Seafood Shack—which he still owns. The latter was even featured as a segment on Guy Fiere’s popular Food Network series Diners, Drive-In’s and Dives, which Medina discovered randomly discovered while channel surfing one afternoon. 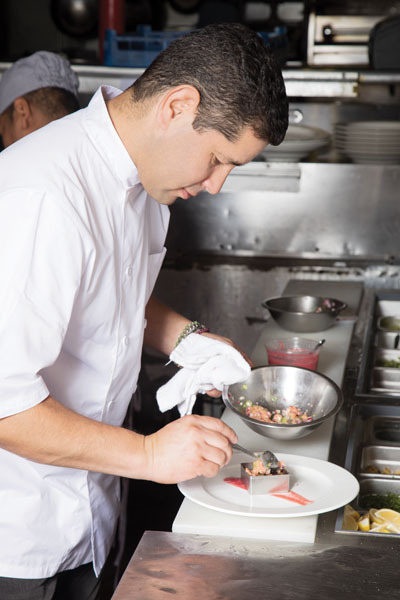 “From that moment, I said to myself, ‘if I ever decide to open my own restaurant, Carlos will be the guy to do it with because number one he’s a great cook and number two he already knows what to do because he’s in the business,’” Medina recalls. Going forward, the pair is looking ahead to additional locations, with their newest one slated to open in central New Jersey sometime in early 2019. They’re also continuing to expand and experiment with the menu, always injecting an element of surprise that Barroz says is one of his favorite parts of the enterprise.